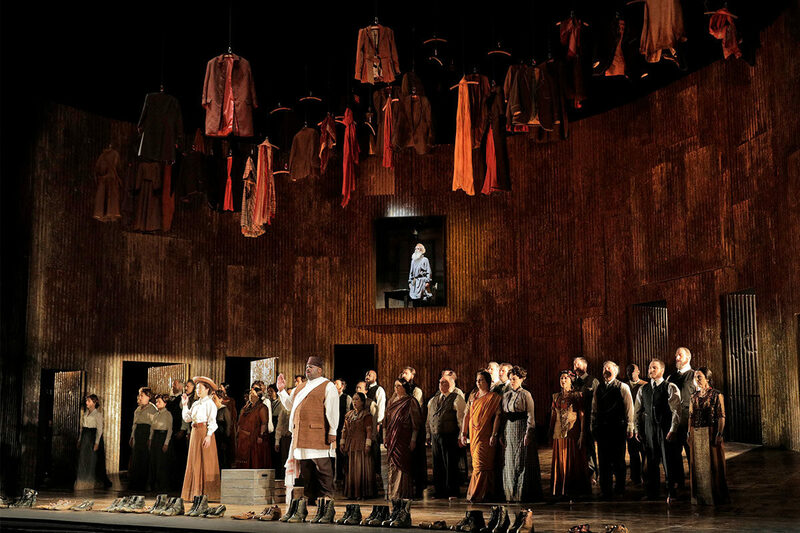 A fantasia or meditation on the life of Mohandas Gandhi might not seem like the ideal choice for an opera, but “Satyagraha,” which Philip Glass composed nearly 40 years ago (it premiered in 1980), is musically spellbinding. 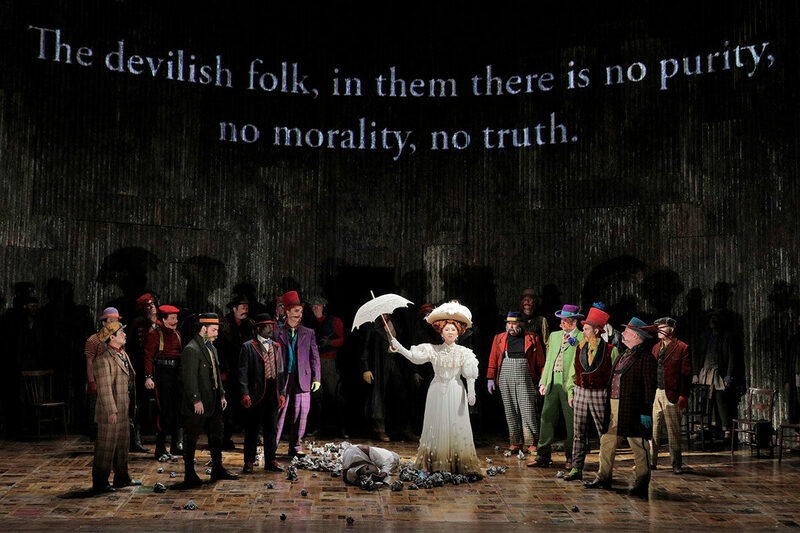 It is also, in this co-production of the English National Opera and the Metropolitan Opera, with Improbable Productions providing the icing, visually stimulating as well. But it doesn’t stop there. 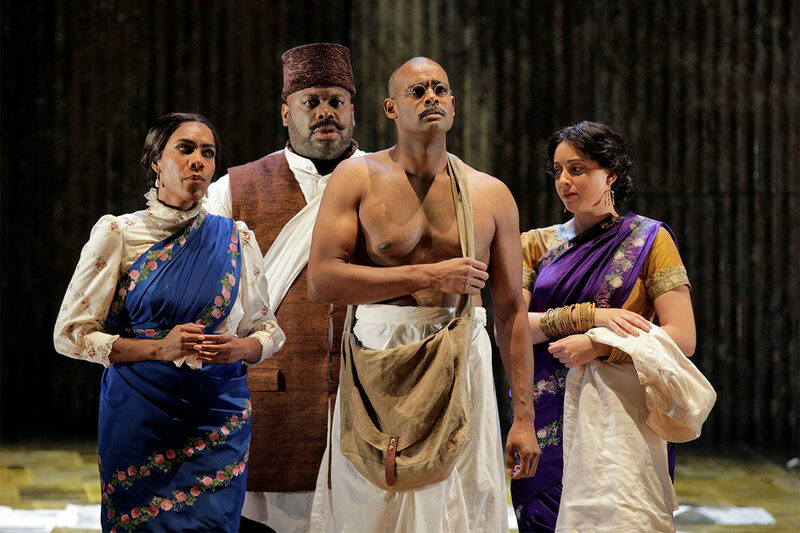 Gracefully conducted by Grant Gershon, and with a standout Sean Pannikar in the lead role as Gandhi, “Satyagraha” is making an impressive debut at LA Opera where it’s being staged through Nov. 11 in the Dorothy Chandler Pavilion. “Satyagraha” is a term, coined by Gandhi, that is being translated here as “truth force,” but it can also mean “holding onto truth,” used to imply or urge resistance through non-violence. If this sounds a bit like Martin Luther King, Jr., well, just you wait. Philip Glass is prominent (with John Adams, Tobias Picker, etc.) among living American opera composers. But Glass has been especially visible in Los Angeles for a long time. The Philip Glass Ensemble often used to perform original film scores live at screenings of “Koyaanisqatsi,” “Beauty and the Beast,” “Dracula,” and other works, many times at Royce Hall or the Wadsworth Theatre. It was always a thrill for those who attended. As for the operas, I’d say that Long Beach Opera has been at the forefront, with “The Perfect American” a couple of years back and “In the Penal Colony” slated for next April and May. 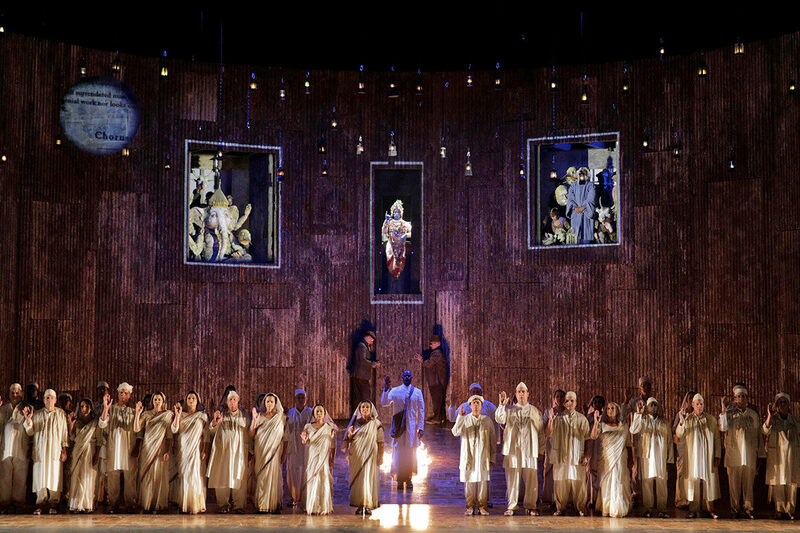 LA Opera finally got on the bandwagon when it presented “Einstein on the Beach” in 2013 and “Akhnaten” in 2016. Phelim McDermott, the director of “Satyagraha” (and the earlier “Akhnaten”), is co-founder of Improbable but with a reputation for his inventiveness: “Shockheaded Peter,” for example, was widely hailed when it came to L.A. many years ago. 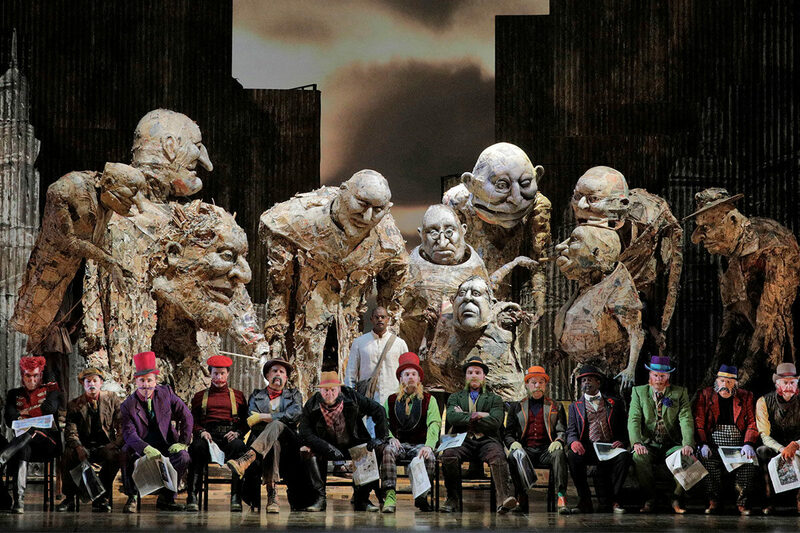 With scenic designer Julian Crouch, costume designer Kevin Pollard, lighting designer Tony Simpson (Paule Constable, originally), and with movement and puppetry overseen by Rob Thirtle, “Satyagraha” is somber-toned yet luminescent, with a tinge of Cirque du Soleil’s slightly disarrayed surrealism. The latter includes giant puppets that stumble onto the stage to observe or do battle, along with an array of objects (lamps, suitcases, cloaks, etc.) that rise like vapor into the rafters overhead. The vocal text, adapted from the “Bhagavad Gita” by Constance DeJong, who also wrote the book of the opera with the composer, is sung in Sanskrit, which probably few of us are conversant in. However, with the exception of title cards when there are scene changes (three in each of the first two acts, one in the third), and isolated lines from the “Bhagavad Gita,” there are no projected supertitles. If you’ve been alerted to this beforehand, you’ll immerse yourself in the synopsis, because “Satyagraha” isn’t a straightforward story. And while supertitles would certainly be helpful in some ways, it’s hard to argue that they wouldn’t be a distraction, and that aesthetically they would ruin the gorgeous look of the production. The three acts are each overseen (literally from on high) by guardian spirits: Leo Tolstoy (representing the past), Rabindranath Tagore (the present), and Martin Luther King, Jr (the future). Even so, the events depicted, during the 21 years that Gandhi spent in South Africa, which shaped and formed his ideas of nonviolent resistance, are not presented chronologically. The vocally silent Prelude is in 1893 (when Gandhi arrived… by being thrown off the train), but then in act one we go from 1910 to 1906, and in act two we’re initially in 1896, then 1906 and 1908, and then finally for the rather drawn-out third act we’re entirely in 1913. Soon after this Gandhi would leave for India, and it’s in India that we have the famous image of him as an older man, swathed in white and sitting near a spinning wheel, a short time before his assassination in 1948. 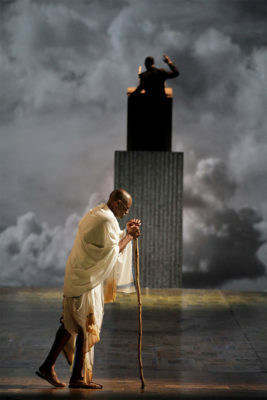 Each scene or tableau zeros in on a key moment in Gandhi’s life, and they include people who were instrumental in it: Not only his wife, Kasturbai (J’Nai Bridges) and his secretary, Miss Schlesen (So Young Park), but Indian co-workers (Erica Petrocelli as Mrs. Naidoo and Morris Robinson as Parsi Rustomji) and his European co-worker (Theo Hoffman as Mr. Kallenbach), plus the gallant Mrs. Alexander (Niru Liu) who comes to his aid when his is accosted by an unruly mob. In addition to these people and the three guardians (Tolstoy, Tagore, and King) we have a visitation, if you will, by two mythical figures, Prince Arjuna (Michael J. Hawk) and Lord Krishna (Patrick Blackwell), both of whom are from the “Bhagavad Gita.” So a sense of reverie and even magic realism add to the overall enchantment. And on top of this, we’re told to imagine the opera taking place within one day (as a sort of all-encompassing flashback). That’s why one should familiarize oneself with the synopsis beforehand. As for the music itself, ahh, the score for “Satyagraha” must surely rank among the finest that Glass has composed. Unfairly labeled “minimalist,” which implies bare and/or sterile, the rising, falling bassline arpeggios seem to bubble energetically beneath a glistening sheen of lighter tones, and despite the so-called repetitions the music is always changing and evolving. In fact, we could close our eyes and listen to this opera the way we’d listen to a concert. And that can’t truthfully be said that about many operas. The music continually flows with an endless vibrancy. Also, once more, the visuals of this production keep stimulating the imagination. To a large extent, the scenic design and the puppetry seem to reference the “Indian Opinion,” the newspaper that Gandhi founded. This applies to the giant puppets (shades of Julie Taymor and Achim Freyer and William Kentridge, etc. ), which appear to be constructed from paper or fiber, plus an inventive use of newspapers appears in many scenes. We would be much poorer without a man of peace and goodwill like Mohandas Gandhi, and the opera reminds us of this at a time when such a reminder is sorely needed. 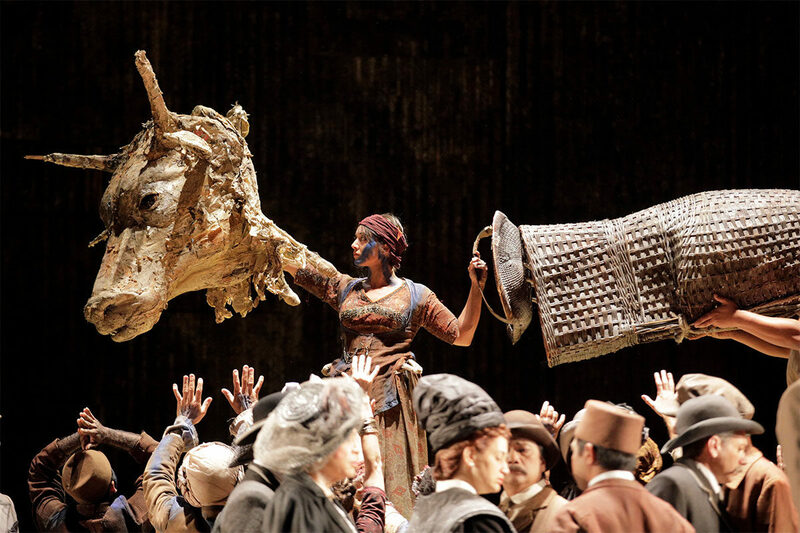 There are more fine operas by Philip Glass that LA Opera could stage in future seasons. I hope they add a few of them to their repertoire sooner than later.